Hampton Terrace and Nejaimes Wine Cellars have had a special relationship for more than a decade. During our off-seasons, everyone who stays at Hampton Terrace for two nights or more receives a $30 Gift Card to purchase wine/beer/spirits or gourmet food from their tremendous selection. We are taking that partnership to a new level on Wednesday, May 18th. 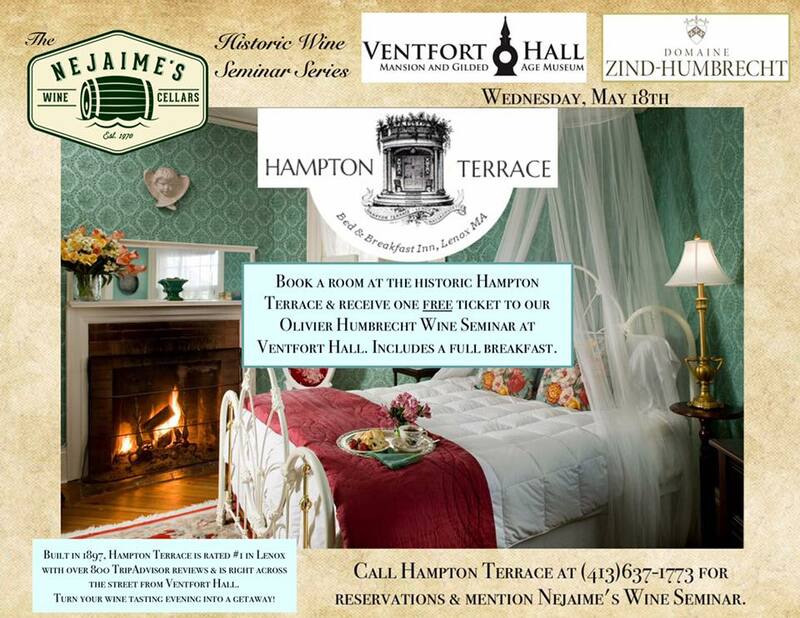 Ventfort Hall, the Jacobean mansion located across the street from Hampton Terrace, is hosting a spectacular wine tasting, and if you stay at Hampton Terrace (at our off-season, midweek rate) we will PAY FOR ONE ADMISSION to the event ($40 value). World-renowned winemaker and owner Olivier Humbrecht will be personally guiding you through three flights (nine wines) from his family’s award-winning vineyard Domaine Zind-Humbrecht of Alsace, France. Olivier Humbrecht is the second winemaker in the world to attain Master of Wine status, and he comes to us on his way to being the 2016 Guest of Honor at the prestigious Nantucket Wine Festival. With degrees from the Ecole SupÃ©rieure dâAgriculture de Purpan and UniversitÃ© dâOenologie de Toulouse in Agriculture and Oenology, respectively, Olivier earned his Master of Wine certification in 1989. That same year, he took over winemaking from his father, continuing an unbroken lineage that extends back to the year 1620. $40 per person, served with cheese and charcuterie. Please call Nejaime’s Wine Cellars at (413) 637-2221 for reservations. There will be an optional guided tour available of the house scheduled before the seminar at 4:30pm for $15 per person; please mention if you would like to attend the tour when making reservations for the seminar. Be advised that you must call to make your reservation. The Nejaime’s Wine Cellars Historic Wine Seminar Series combines phenomenal wines in the beautiful surrounds of historic estates and museums in the Berkshires. A portion of the ticket price is donated to the site so that they may continue to safekeep these national treasures. CALL HAMPTON TERRACE at 800-203-0656 to reserve your room.